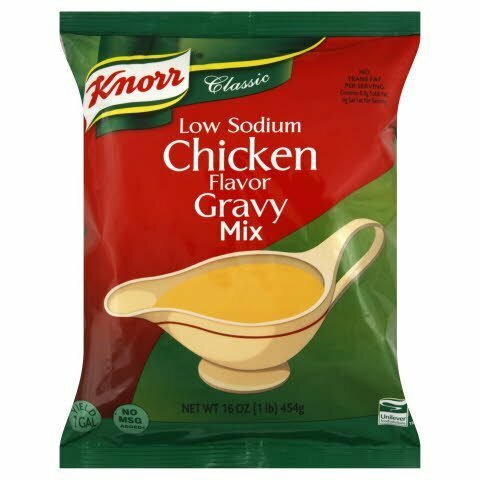 A smooth gravy made with natural stock. Fullbodied flavor is achieved; you'll never miss the sodium. Modified corn starch, whey (milk), instantized bleached and enriched wheat flour (wheat flour, niacin, ferrous sulfate, thiamine mononitrate, riboflavin, folic acid), maltodextrin, chicken powder, cultured buttermilk, chicken fat, hydrolyzed protein (corn, wheat, soy), autolyzed yeast extract, butter (cream, salt), nonfat milk, silicon dioxide (anticaking), onion powder, salt, disodium guanylate, disodium inosinate, xanthan gum, sugar, spices, chicken flavor, natural flavors, lactic acid, tocopherols and ascorbyl palmitate (to protect quality), beta carotene (color), soy lecithin. A smooth gravy made with natural stock. Full-bodied flavor is achieved; you'll never miss the sodium. 1. Gradually whisk contents of package in 1 gallon (3.75 liters) of cold, warm or hot water.2. Cook in a steam table, stove top or microwave until product reaches a temperature of 180°F (82°C) for 1 minute.3. Stir occasionally. Classic Gravies deliver superior quality with a broad selection of classic flavors.